The balance of trade in services. Net current income e.g. profit from overseas investment. Transfer payments e.g. payments to the EU. A deficit implies imports good/services greater than exports. 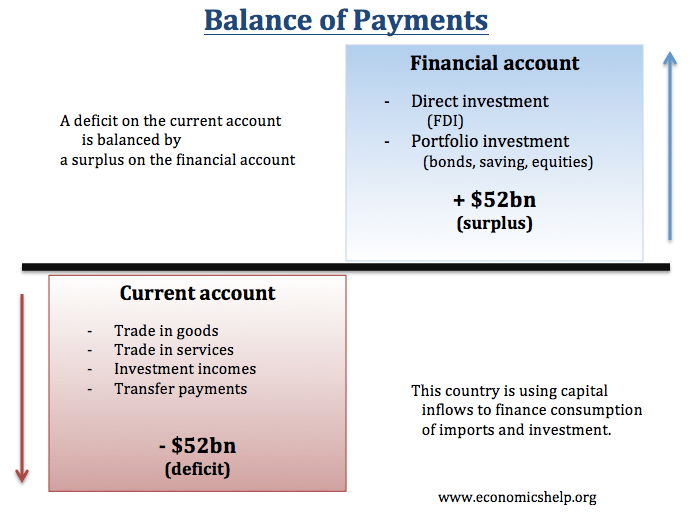 The net balance of trade in goods and services is the biggest factor in determining the current account. If there is a deficit on the current account, there will be a surplus on the Financial/Current account to compensate for the net withdrawals. 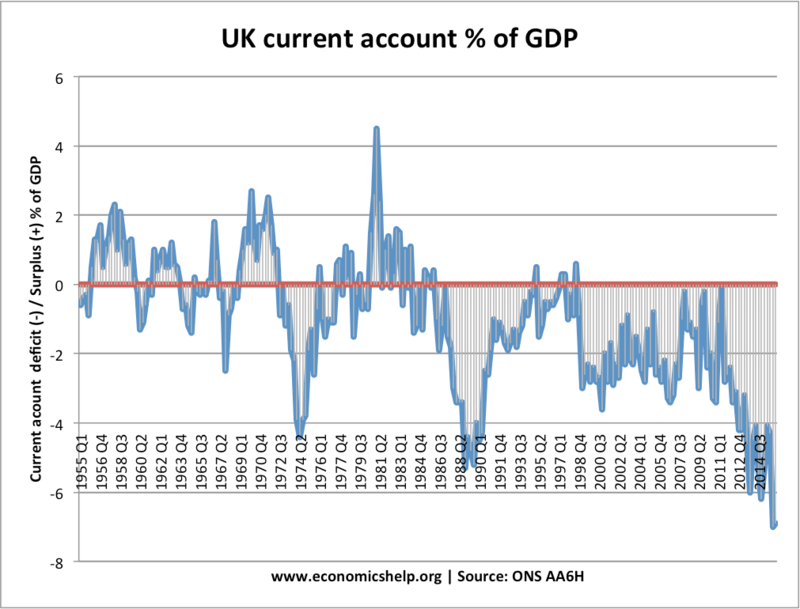 A period of consumer-led economic growth will cause a deterioration in the current account. Higher consumer spending will lead to higher spending on imports. At the end of the 1980s, the UK economy was booming with rising consumer spending and inflation. This led to a widening deficit on the current account. The recession of 1992 led to an improvement and a brief surplus in the mid-1990s. The recession of 2009 also led to a temporary improvement in the deficit as consumers cut back on spending. Marginal propensity to import. In the UK, consumers often have a high marginal propensity to import – this means a high percentage of extra income goes on imports. Therefore, in periods of economic growth, we see a significant rise in import spending. Depends on the type of economic growth. Economic growth can be export-led or investment-led. In this case, exports may be growing faster than import spending. 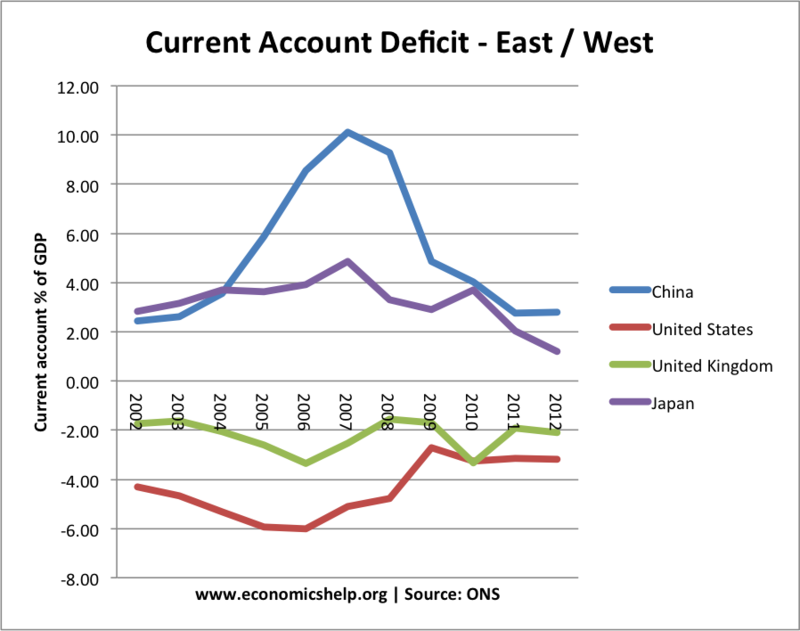 For example, economies like China and Germany have experienced high economic growth, but also a current account surplus. This is due to the export-led nature of growth. A depreciation in the exchange rate makes the currency relatively more competitive. After a depreciation, exports will be more competitive and imports more expensive. This should improve the current account. However, it requires the demand for exports and imports to be relatively price elastic. If demand is inelastic, then cheaper exports will only cause a small rise in demand and the actual value of exports can decrease. 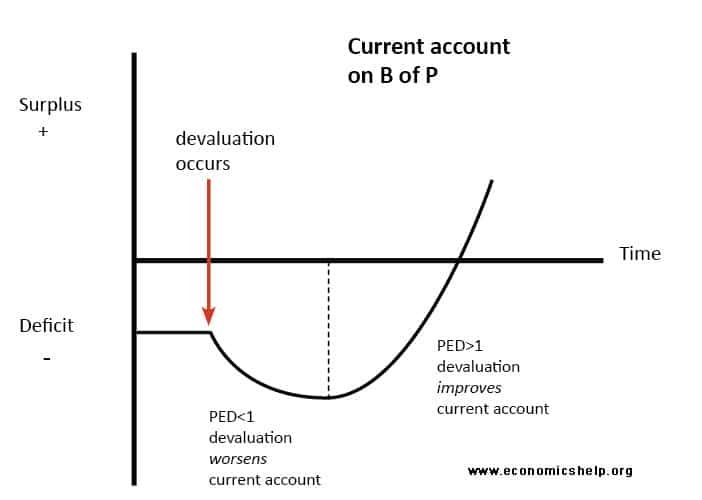 There is often a time lag effect between a depreciation in the exchange rate and improvement in the current account. In the short term, demand is inelastic, but over time, consumers become more price sensitive and the depreciation starts to improve the current account. A depreciation may only cause a temporary improvement in the current account if it causes domestic inflation to increase. A depreciation can cause inflation for three reasons – 1) raises the price of imports, 2) increase domestic demand and also 3) may reduce the incentive of firms to cut costs – if this causes inflation, then the country will lose competitiveness and this will offset the improvement from the depreciation. Competitiveness and relative inflation rates are particularly important for countries in the Euro – where they cannot devalue or allow the currency to appreciate. 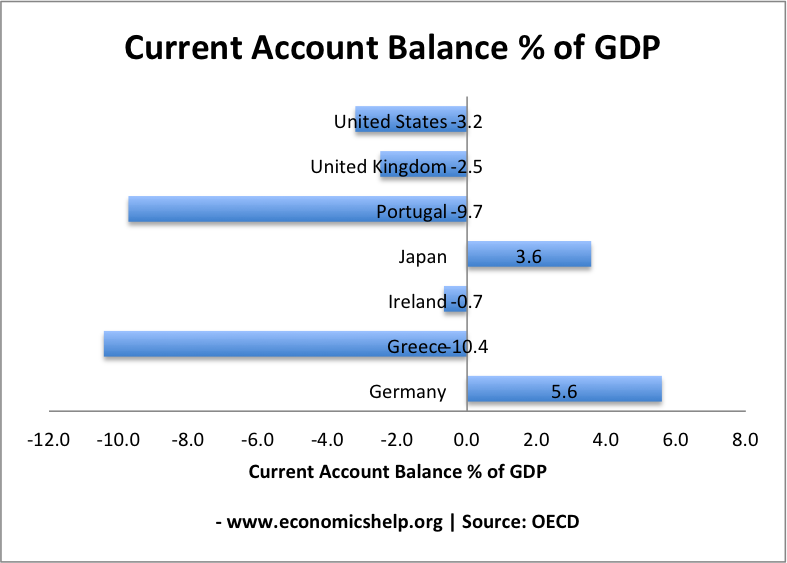 The Euro has tended to magnify current account imbalances. In 2010, Greece and Portugal had a current deficit of close to 10% of GDP. To some extent, the size of a sustainable current account deficit depends on how the level of capital flows a country can attract. For example, in the past, the US was able to run a persistent current account deficit of 3% of GDP or more (see: US Current account deficit) because foreign investors wanted to buy dollar assets. Without this demand for dollar assets (such as Treasury Bills) there would have been a decline in the value of the dollar which would have reduced the size of the current account deficit. In particular, China (which has run a large current account surplus) has accumulated foreign currency reserves and has been willing to buy dollar assets. This inflow of currency enables the US to run a current account deficit. If the US stopped attracting capital flows, the dollar would devalue and this would act to reduce the current account deficit. A balance of payments crisis usually occurs when a country has a large current account deficit, but investors lose confidence and start to withdraw capital. The capital outflows cause a devaluation and inflation and further fall in confidence. This explains why capital inflows are important for enabling a long-term current account deficit. A country with a low savings rate and high % of consumption will typically have a higher current account deficit. This is because a higher percentage of national income is going on consumption (which approx 1/3 may be imports). Countries with higher savings and higher levels of investment tend to have an economy more geared towards production, exports and a lower share of income goes on imports.